Head's World! : Episode 26 : The Sword of the Atom issue 2! Episode 26 : The Sword of the Atom issue 2! Not sure what happened, but it appears I forgot to post the blog page for the 26th Episode of Head Speaks : The Sword of the Atom issue 2! This month on "What's In Head's Longbox? ", we're going to continue taking a look at The Sword of the Atom, with issue 2. 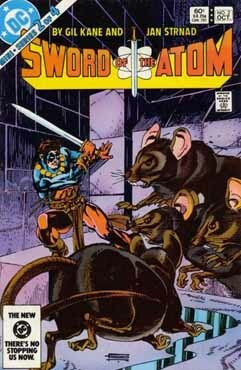 Title: "A Choice of Dooms"
We start off where last issue ended with Taren and The Atom facing off an army of rats. Suddenly gas starts entering the room, knocking the two men out. Deraegis tells the king how the two men will make fine gladiators. Ray is locked up and thinks how he picked up some of the language on the ride in and after a few days he’ll have it down. After weeks locked up, he’s finally given a new costume and sent out to fight. His opponent is a blinded Taren. When the crowd sees what happened, they begin turning on the king for his cruelty. Pohrager, one of the trainers, helps Taren and Ray escape as the crowd rushes the stage. He takes them to a frog that is awaiting them, along with Laethwen. As the guards rush him, The Atom tries to hold the guards back so Taren and the Princess can escape, but Pohrager, says that he’s not saving Taren, but The Atom. The guards take Pohrager to the king whom he tells that the people have turned against him when they saw he blinded a prisoner for sport. The king is confused by his accusations. Back in the forest, Ray thinks back to how he got here and the events of issue 1. When they stop, Ray tells Laethwen his story and she relates theirs to him. They are from another planet. Morlaidh was established to be a penal colony for political undesirables. Without support from home, their technology failed and they became more barbaric. They started splitting in to warring tribes. Her father wishes to unit them , while Deraegis thinks it can only be done via conquest. Laethwen says that her dad’s adviser has turn the king in to a cruel man obsessed with his dreams. While talking Taren yells for help as he’s confronted by a lizard. Atom throws his sword in to the lizard’s mouth to scare it off, and then the creature is fell by a barrage of poisoned arrows by Taren’s band. Back in Morlaidh, the king tells his adviser he can deal with Pohrager as he sees fit. Taren introduces The Atom to his group and he is welcomed in to the tribe. Back in Morlaidh, we find Pohrager being hung and thirsty, driving the city even further against the king. Deraegis takes the prisoner some water and tells him that Caellich’s cruelty has not gone unnoticed and he’ll soon be freed. He says that there is talk of rebellion, which townsfolk over hear which fans the flames of revolt even more. Back in the woods, Laethwen tells The Atom how even away from their home planet, class prejudices still rule and it took her awhile to overcome that to admit her feelings for Taren. Taren tells the pair that he was betrayed by one of his own. Now that he’s blind, Atom will have to lead his men. He makes a comment how the forest is dangerous for the weak, careless, and disabled. As Atom leave Laethwen to try and talk sense to a despondent Taren, he’s cold cocked by one of Taren’s men, Voss, who believes The Atom is a spy working for the king. The fight a little as Voss is knocked next to his poison arrows, of which he grabs and threatens Ray with. Cut to the Loring/Palmer house where Jean calls up Paul to have someone to talk to. Being a wonderful human being, he offers to come over to comfort Jean. Be sure to take a listen and let us know what you think. Then on "Where is Head Going? ", I talk briefly about Saturday Morning Fever from the Fire and Water Network.